Not a lot going on a Blackbushe auction centre today. Just a general sale, a small fleet and finance section and part-exchanges from West London Nissan, Hartwells and Pendragon. Most of the regular traders had taken the day off too so there were more bank holidaymaking members of the public than anyone else. Though they tended to take the bidding a bit further than the trade would have, some drove home in bargains. 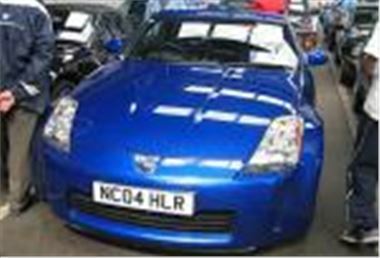 Reserve on the 9k mile 04 reg 350Z in the photo was a bit too much for anyone on the day and it remained unsold to a top bid of £19,400. But plenty of other cars did sell. A smart looking black 35k mile 99V Ford Cougar 2.5V6 went for £4,025. An 84k mile unwarranted 98S Freelander 2.0XDI 5-door sold for £3,650. A 42k mile 2000X Alfa 156 1.8TS Lusso made £3,350. Fleet & Finance, Lex Vehicle Leasing, Leaseplan, Dealer Direct, Franchised Dealer p/xs, Lancaster p/xs, Sytner p/xs, Ridgeway p/xs, Snows p/xs, Whites p/xs, Black Horse.